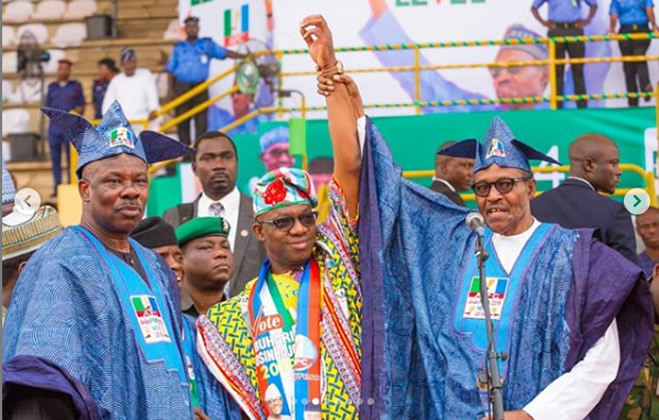 Governor Ibikunle Amosun of Ogun incredibly celebrated the near-riotous show at the Presidential rally of the All Progressives Congress in Abeokuta Monday. According to a post on his Facebook page on Monday reporting on the event, Amosun gloated over the ‘protests’ by members of his Allied Peoples Movement(APM) and that the National chairman of the APC, Adams Oshiomhole, former governor of Osun, Rauf Aregbesola and the director-general of the Presidential campaign, Rotimi Amaechi were ‘booed and stoned”. His report did not accurately reflect what transpired at the rally, where President Buhari was almost attacked by the unruly APM supporters the governor invited to the APC rally, when the president presented Prince Dapo Abiodun as the APC candidate in the state. From TV live streaming, the President presented Abiodun as the governorship candidate of the party, but Governor Amosun slanted his report to give the dampening side of it. “When Comrade Oshiomhole and some party members took Prince Dapo Abiodun to the president for him to present, the president instead announced, ”for the other elections, let the people of Ogun State decide”, Amosun reported in the post, which has attracted hundreds of adverse commentaries. The crisis rocking the All Progressives Congress (APC) in Ogun State boiled over today (Monday) when protests by party members marred the presidential campaign rally as party members booed the National Chairman of the party, Comrade Adams Oshiomhole, former Governor of Osun State, Ogbeni Raufu Aregbesola and Director General of the APC Presidential Campaign, Rotimi Amaechi . Asiwaju Bola Ahmed Tinubu, for the first time in the APC Presidential campaign, declined to make a speech at the event as he exited the venue through the backdoor as President Muhammadu Buhari made his speech. President Buhari, as he did at the presidential rally of the APC in Owerri , Imo State, asked members of the party in the state to vote for any candidate of their choice apart from the presidential election. However, on the much-awaited presentation of the gubernatorial candidate of the party, the president advised members of the “to vote for any candidate of their choice”.